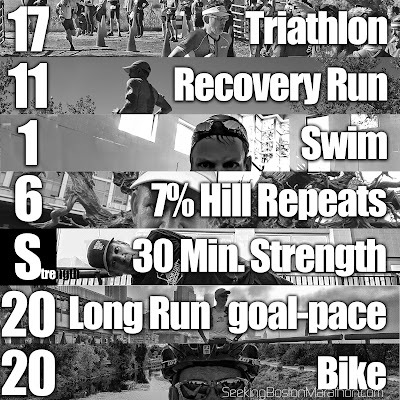 Sunday: Race Day! In this case it was the swim, bike, run variety. Only my second race of the year (third if you count the Girls on the Run Fun Run back in May--that was my highest podium ever, but it was against a field of 200 little girls. I digress.) 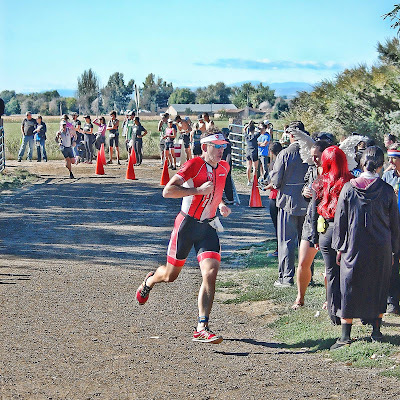 As I wrote last week, I was thrilled with the race--in particular my run; not getting passed by anyone in my age group and passing three that were and sub seven minute per mile pace. Pow! Monday: With adrenaline no doubt coursing through my veins, I took to the trail near my house for a nice and easy eleven mile recovery run. Is that an oxymoron? Eleven miles to recover? Tuesday: Sticking to my practice of alternating running and swimming and biking, I took to the water. This gives my foot and bones a break. Two 800 meter sets totaling one mile. I added my usual routine of 25 minutes of strength and stretch work afterwards; side planks, side leg lifts, regular planks and foam roller. Wednesday: Work took me to Seattle. I somewhat dreaded this workout today as I prefer to have tough workouts in the morning or over my lunch hour. Today had hill repeats on the menu early evening. I alternate time in downtown Seattle vs Bellevue when I visit there. Both have great areas to run in and both have hills. Somewhat unconventional, I found a city block that was 1/8 mile in length. I later calculated it to be a 7% grade. Two mile warm-up, and a set of eight sprints up the hill. This was a tough one. Thursday: Looking ahead to my weekend, I needed to move my long run to Friday morning so I treated this as pretty much a rest day, but put a solid thirty minutes in the gym again with my strength and stretch routine. 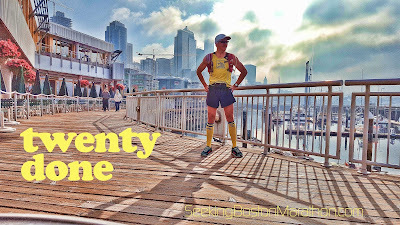 Friday: My first twenty-miler of my training cycle with progressive marathon goal-paced miles. Two mile warm-up followed by four sets of four mile runs (each getting progressively faster.) For this leg of the trip, I chose to stay at the Marriott Waterfront which has a great (as you guessed it) "waterfront" path veering North along Elliott Bay. I decided to run a ten mile route (twice.) Breaking up a twenty miler as two warm-up, 4 x 4 miles, and two mile cool down seems so much easier to digest. Given that, I hadn't run this far in over a year and it definitely proved a bit challenging. The first four miles "hovered" marathon and BQ pace of slightly below an eight minute per mile pace. Second set was 7:52, 7:47, 7:43, and 7:49. Third set was 7:43, 7:49, 7:46, and 7:48. Fourth set was starting to become a bit tough but held paces of 7:50, 7:56, 7:52, and 7:36. In hind sight; travel, aggressive hills only two days prior and venturing up to twenty for the first time in over a year was perhaps not the best combo as my last set should have been the fastest. The final mile was however 7:36. Finished with a sluggish two mile cool down. Saturday: Back in Denver, I needed another non-run workout. Twenty miles on the triathlon bike on a gorgeous Colorado afternoon. 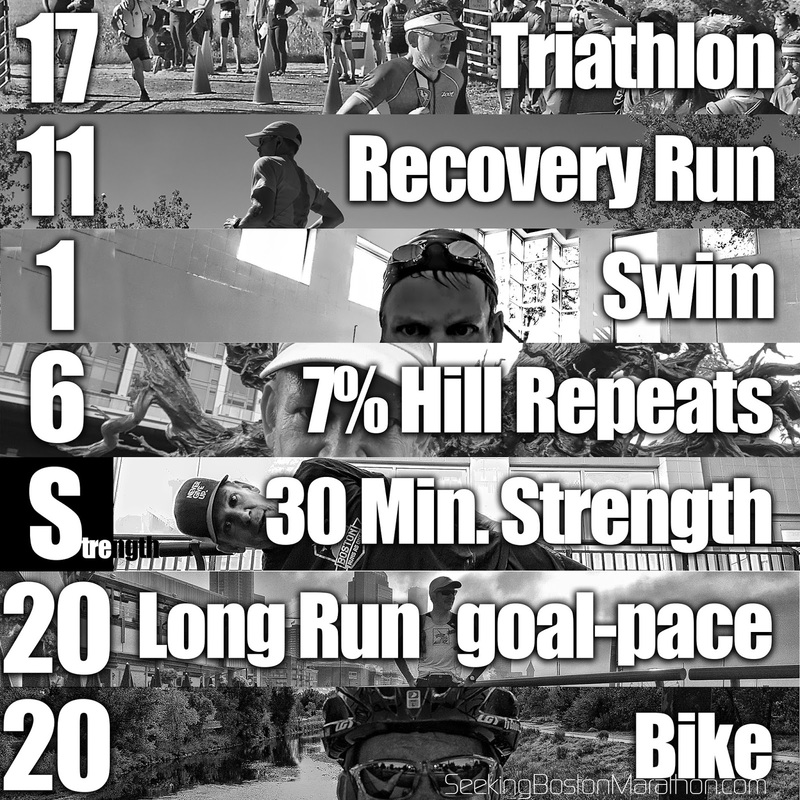 Seventy five mile all purpose miles this week. Yes, technically, a run race calendar is Monday to Sunday, but in this case I wanted to highlight the fact that I finally raced again. Woohoo! Up next? The Runner's World Half Marathon & Festival in Bethlehem, PA Oct. 14-16th. 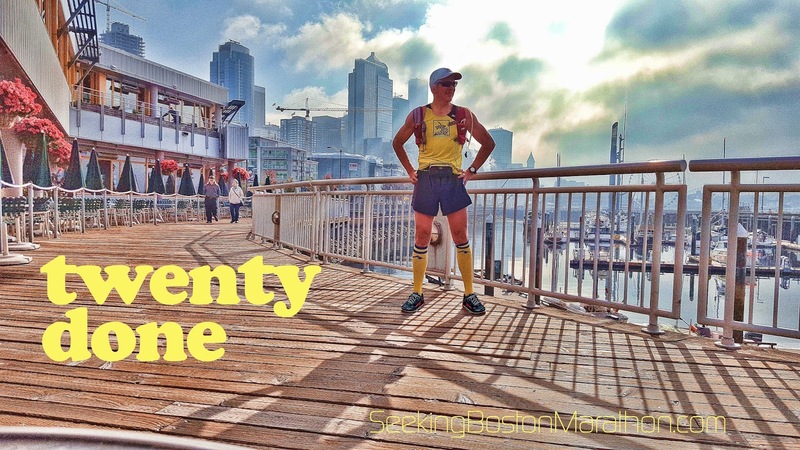 Use code: "SeekingBostonMarathonBlog" for 10% registration.